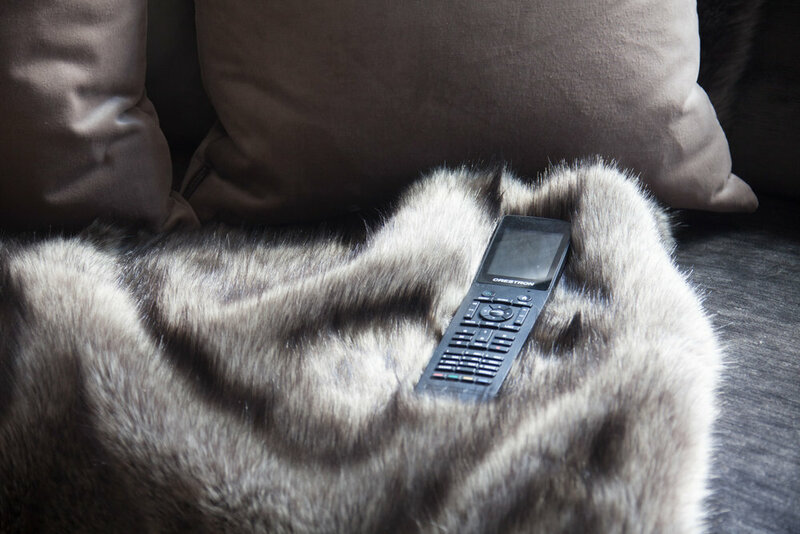 We are very fortunate to have worked closely with The Llama Group on some of their prestigious properties. 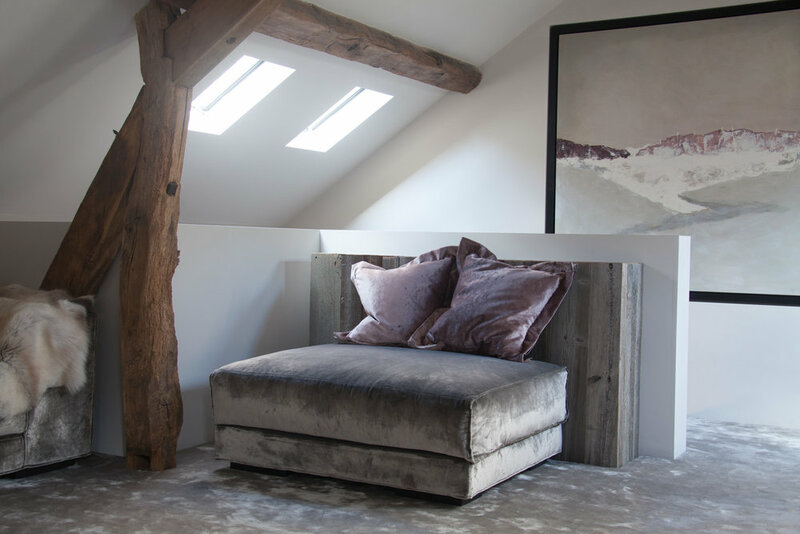 The launch of Janey Butler Interiors led them to search for a location to showcase their various ranges of European designer furnishings, as well as their attention to detail in property development. 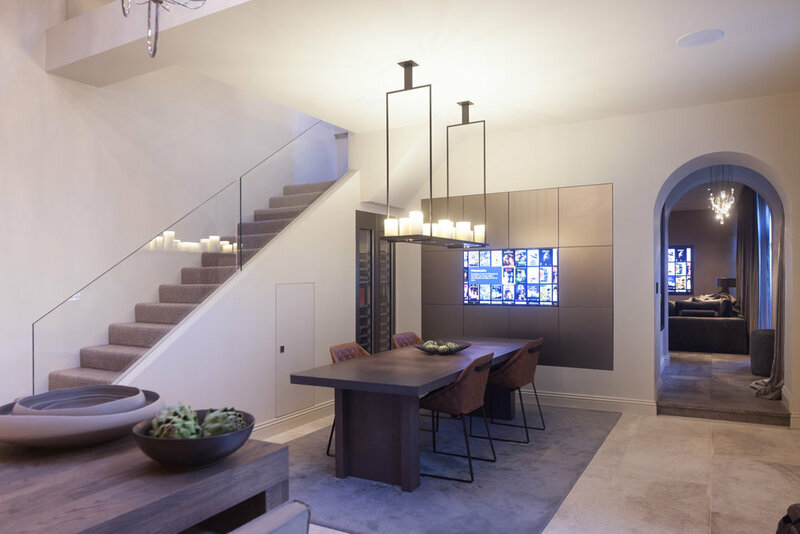 It was the perfect opportunity for us to work with them once again to create an unparalleled showcase of what is possible when every aspect of the build, technology and interiors are designed side by side. 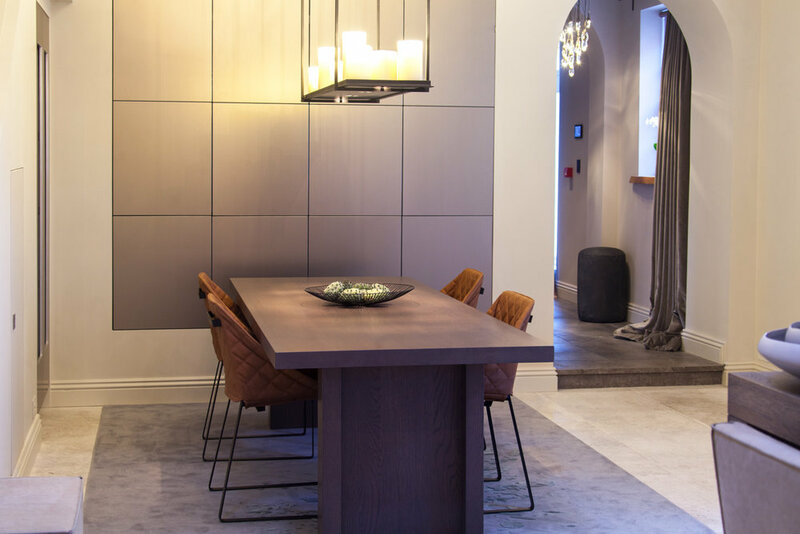 The Llama Group show home has given Intuitive Homes and Ultamation the opportunity to showcase what we feel is our perfect synergy of design installation and world class programming in a showroom where we can take potential clients to demonstrate what is possible in the systems we provide. The showroom comprises of a kitchen and dining area, media room/lounge, bathroom, bedroom and two office mezzanines. There are 6 zones of HD video distribution provided by a Crestron DigitalMedia matrix and 7 zones of audio distributed via a Crestron CNX amplifier. 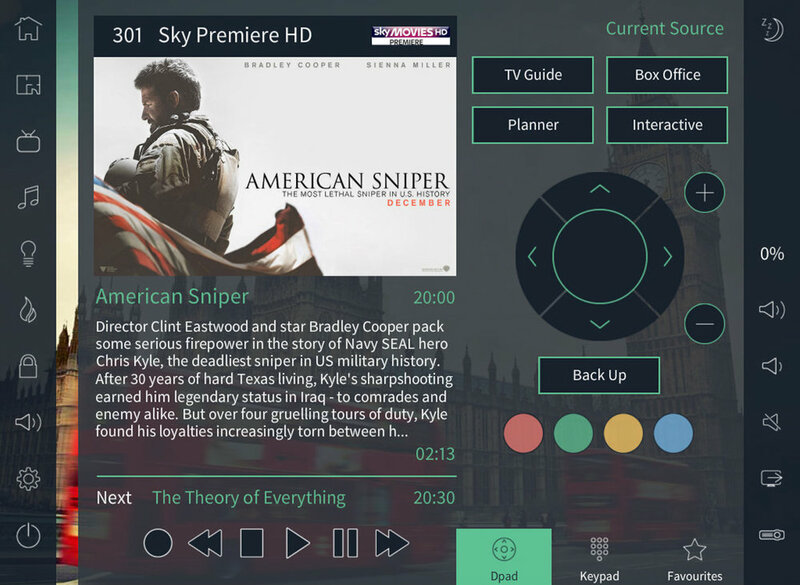 The video sources for the system are Sky HD, Kaleidescape, an Oppo Blu Ray Player, a PS4, an Apple TV and a Raspberry Pi for customized demo reels and slideshows. The audio sources for the system are all of the above plus a two zone Autonomic music server and a Crestron NSP network music player / iOS device dock. As you enter the showroom the first area you see is the kitchen area, with its fully functioning Bulthaup kitchen. 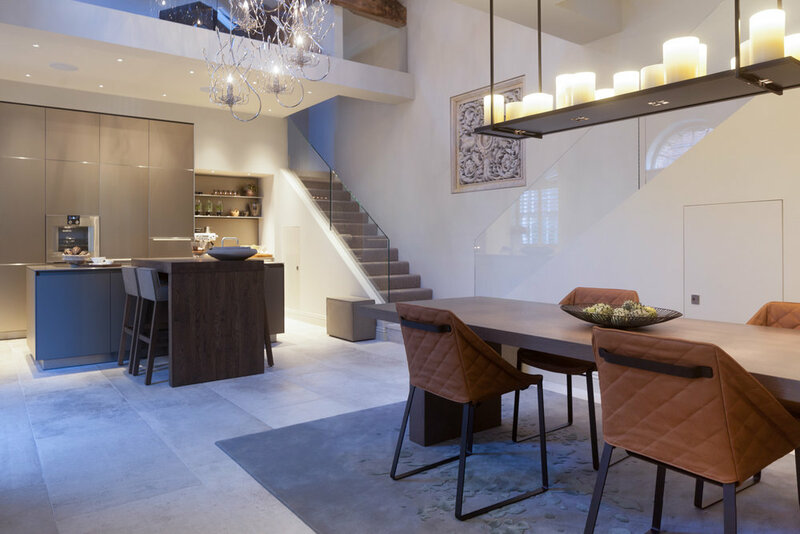 We have a Lutron keypad by the door with a ‘start the day’ button to light the whole showroom with our customised lighting scenes, and also automatically start a playlist of background music from the Autonomic MMS in the main areas. If we have a prospective client coming to visit, we have a Crestron NSP linked to an iPhone dock on the countertop where they can dock and charge their phone as well as choose their own music to play during the tour. Beside the main door is a Crestron TSW-1052 touchpanel which gives access to everything in the showroom. 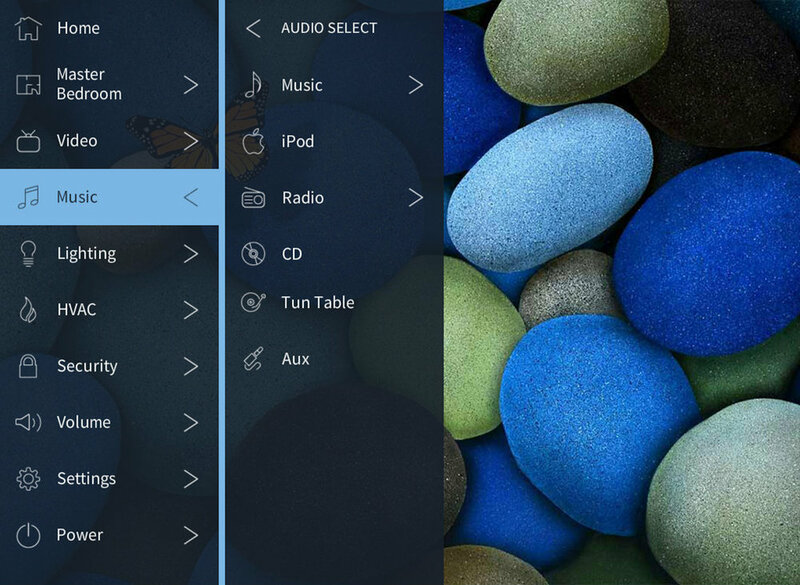 Our User interface is detailed in a latter section. The dining table is primarily used for meetings, and as such we have installed one of our favorite pieces of ‘home automation’. 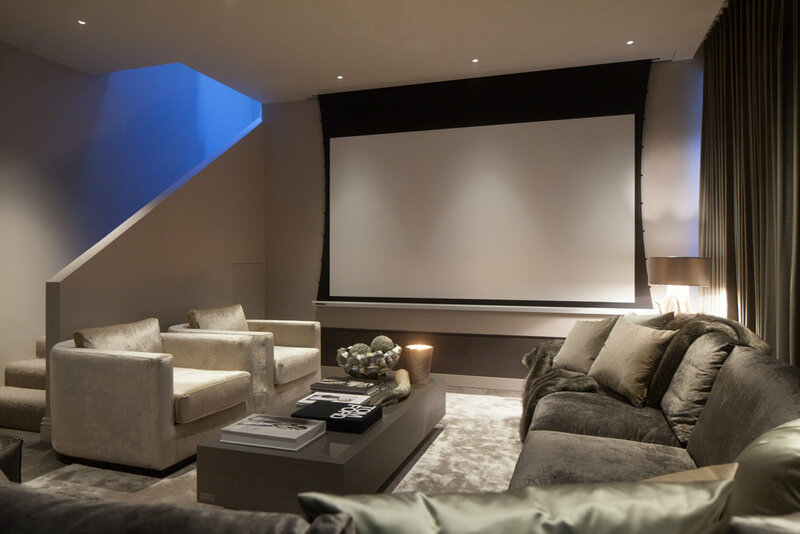 The custom-built Future Automation sliding panel system hides a 50” Panasonic 4K screen within a paneled wall. These are custom Balthaup beveled edge panels in a matching finish to the kitchen and adjacent wine fridge. 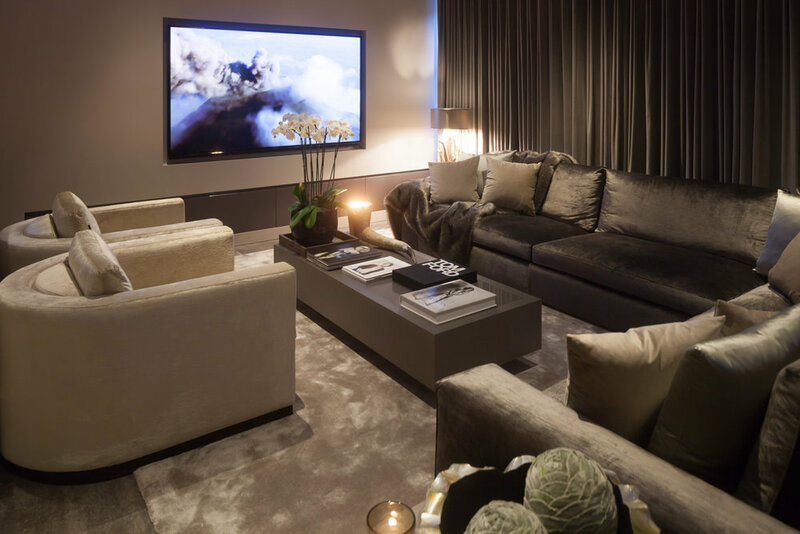 The media room / lounge is the centerpiece of the showroom, where we wanted to find a balance between a discreet TV lounge and a fully-fledged home cinema. As we are demonstrating a couple of methods for hiding displays in other rooms we felt that we could have the 85” 4K Panasonic display unapologetically on show! Other than the huge TV in this room everything else is discreet and hidden away. We have installed 3 plaster-over Amina speakers around the TV for the front channels and B&W in-ceilings for the surround speakers. We have a hidden in wall sub and all of the equipment for the room is housed in the main rack. Once we have demonstrated some 4K content on the Panasonic screen we can move onto the Cinema demo! A single button press from any of the controllers will start to dim the lights and if the demo is being done between the hours of sunset and sunrise, close the Lutron curtain track system. The Screen research tab-tensioned motorized screen drops from the ceiling in front of the Panasonic and the Anthem amplifier changes profile to take into account the slightly different audio properties of the center channel Amina speaker which is now passing through the acoustically transparent screen. Whilst all this is happening the Future Automation projector lift lowers at the rear of the room and the Runco LS-5 projector fires into life. 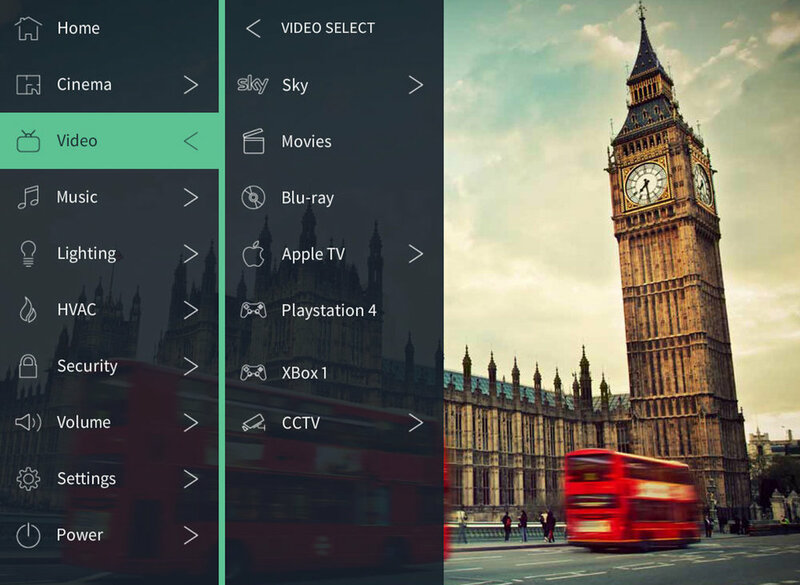 We can then give the true cinema experience via films from the Kaleidescape system or Oppo Blu Ray player. As an additional source we have a PS4 distributed and have some racing games to show off, as most people have never seen video games on such a scale! All of the systems in this room are tied into the Kaleidescape markers system so that when the film finishes the Crestron system will raise the lights and open the curtains as well as retracting the screen and projector. 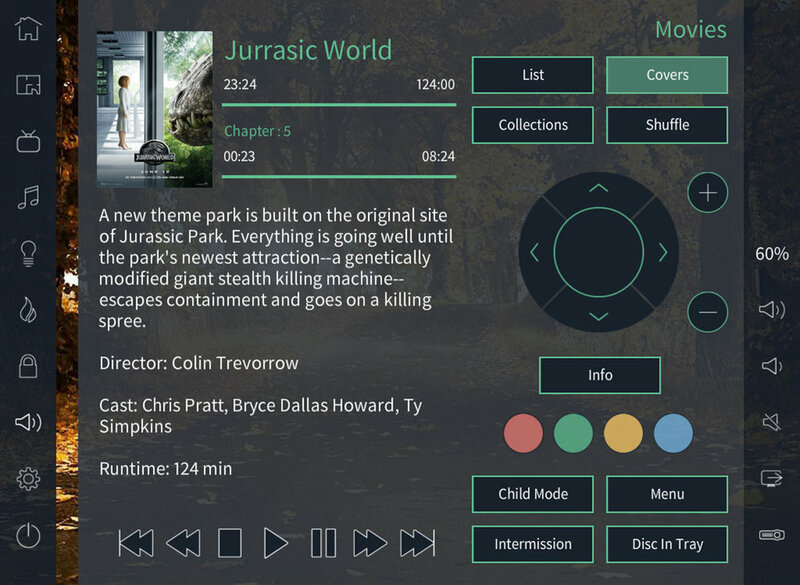 In addition to the ‘whole house’ controllers we have a dedicated Crestron TSR-302 handheld controller which benefits from a touchscreen to allow more detailed control and feedback than the HR-150’s, such as movie information or access to the lighting scenes or heating. On the stairs to the bedroom we have installed tread sensors in the top and bottom steps, which in conjunction with the occupancy monitoring from the Texecom alarm system, allow us to trigger the bedroom lighting before anyone enters the space. Similarly when the last person leaves the room we can make sure the lights are switched off. The display in this room is another 50” Panasonic this time in a Future Automation PL TV lift. This lift is built into a reclaimed barn wood cabinet, which matches the finish behind the bedhead. The speakers are discreetly concealed B&W M1s mounted to the existing oak beams. 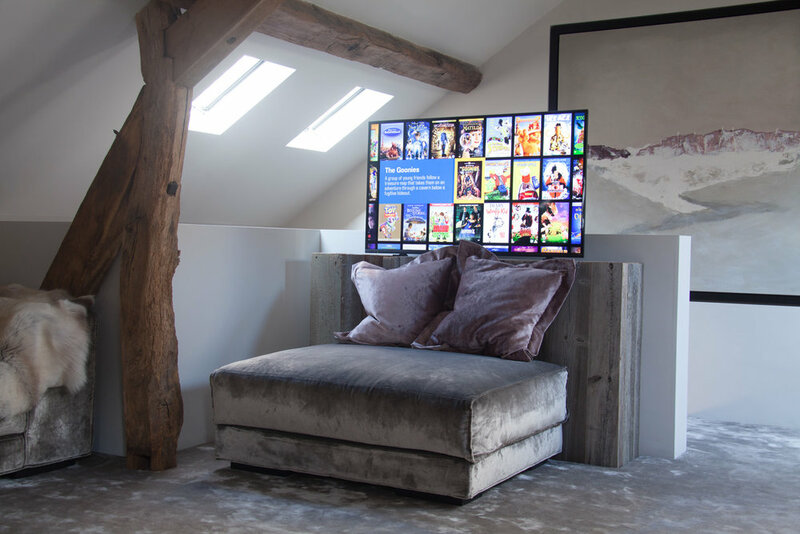 Here we wanted to show that although a 50” TV may seem excessive for a bedroom, if it is only on show when being watched then that should alleviate the concerns of a large TV ruining the feel of the room. In this room we are using a Crestron HR150 as a dedicated controller as well as the larger handheld TST-600 touchscreen so clients can see the pros and cons of a small and easy to grab handheld versus the larger but more versatile touchscreen. The showroom is the first project where we have implemented our new Crestron framework displaying what we feel is one of the most advanced User Interfaces available today. 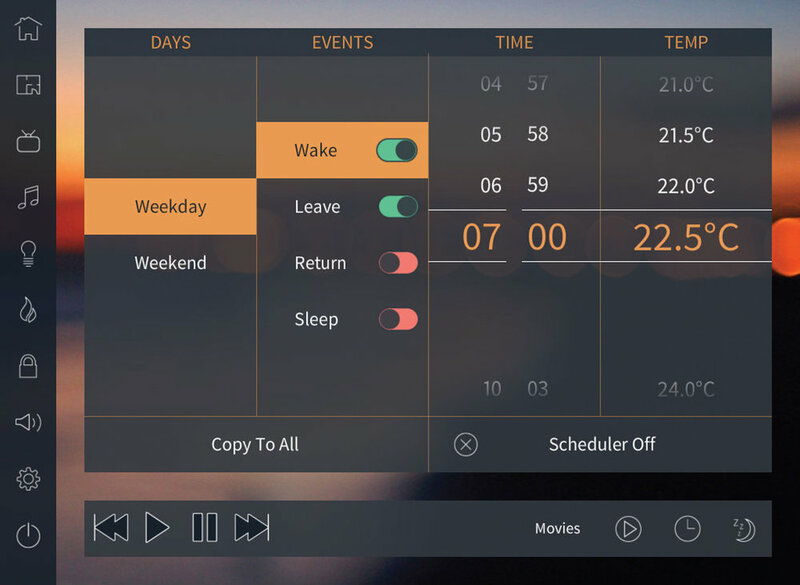 There are many unique features such as our multi user and multi language options and many automated conveniences such as sleep mode, occupancy actions and ‘most used’ menus. 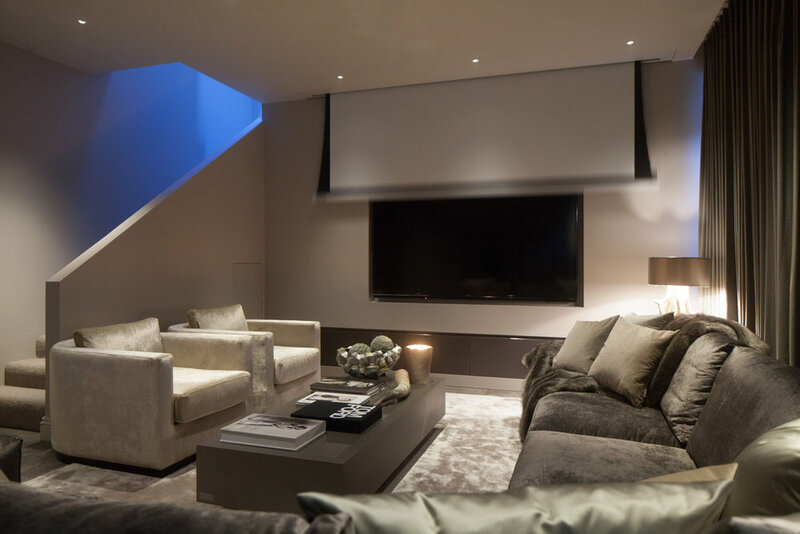 As well as the audio and video systems we have easy access to the 7 zone heating system, Lutron lighting and Lutron blinds as well as integration with the Texecom alarm system. The Texecom integration allows us to use the feedback from the PIR detectors to monitor which rooms are in use and activate the sleep timer if a room is empty. We also use the triggers from entry and arm modes to trigger welcome lighting scenes and all off scenes when the last person locks up. We also have floor plans on the user interface to show which rooms are currently in use or have people in them. The Heatiser Neo heating system is wired to plaster over thermostats so that there are no unsightly controls or sensors in the showroom with all of the controllers mounted within the rack room. The rack is all powered through a SurgeX protection system and networked APC power distribution unit allowing us individual power control of all of the main items of equipment. We have set up periodic 2am reboots of historically problematic items such as the Sky box, to avoid the lock-ups that everyone is familiar with every so often. On the settings page of all of the controllers is an ‘about us’ page. This is essentially each of our logos as well as the Janey Butler logo and Llama Developments logos which you can swipe through. If you hold a long press on the logo of your choice it will turn on the system in that room and activate any lifts required to display the TV. It will then run a preset slideshow or video for that company. We have included case studies, UI examples and short videos in this so that we can quickly and easily show past work to clients. A new system that we are prototyping is full sized touchscreen overlays of the large TV’s using a Crestron XPanel running on a micro-computer/HTPC. We are still experimenting with truly useful applications of this technology but there is a video below showing our current progress. Once we have completed our large scale UI for this we will be installing these in the showroom. Our show home is appointment only so if you would like to come and let us show you round everything that is possible, give some details of your project below and we will be in touch. We will be in touch shortly to discuss making an apppoinment.